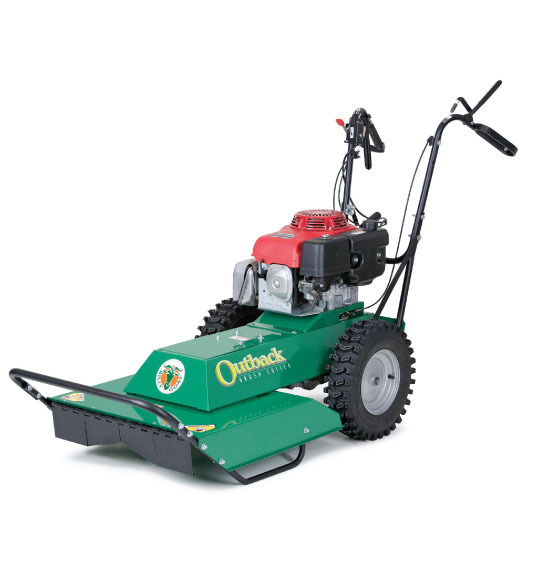 Clear overgrown property easily with the Billy Goat™ 24" Weed Mower. The mower cuts a 2' wide clear path through the densest brush, grass and weeds over 8' tall, saplings up to 1.5" in diameter and other problem vegetation at the rate of 2/3 acre per hour. A heavy-duty steel deck and engine base provide maximum durability. This brush cutter is equipped with a 388 CC Honda engine with a pull start. It combines the transmission and differential into one sealed package with no linkages to snag on brush. In addition, the Billy Goat maintains positive traction on both 16" puncture proof tires, it has three speeds, and it operates in reverse.